WHAT DOES IT MEAN "A DOULA" ? 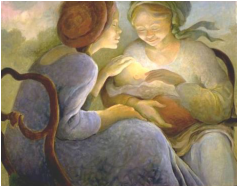 Explanation of the word doula hast to be sought in Greek - δούλη (doula). In ancient Greece so was called the women who accompanied the pregnant mother during pregnancy, childbirth and the postpartum period. Doulas provided these women with continuous emotional and physical support. In modern times, this term was used for specially trained woman who primarily provides mental (and physical) support to the mother in labour. The term was used for the first time in 1973 in the book The Tender Gift: Breastfeeding by anthropologist Dana Raphael, who describes a doula as a woman who helps pregnant women during pregnancy, birth and also postpartum with breastfeeding and newborn care. Today, as doulas we provide support to women throughout the whole period of pregnancy, during childbirth and after childbirth. Doula is not only for the "alternative" (to-be) mothers, it's somebody to stand by your side and help you through the labour regardless what "style" of birth you would like to have. I'm not the one to fight for you in the hospitals, but if you have expectations about how your birth might look like, I can help you to formulate them in your birth plan and express them at the hospital. Again and again am I going to emphasise your central role in childbirth. The birth experience is yours - as a woman and (future) mother - and neither any doctor nor a doula should take it from you. If after the birth you say that you have the impression you were there in a main role and the others just watched or stood by, then my target was fulfilled. In September 2015 I finished my 2-year doula training in the organisation České Duly. I'm accompanying to the births already since the end of 2014 when I finished my first year of study and got a green light to start. I operate in Prague and Central Bohemia (Středočeský kraj), I know the environment of all Prague as well as Central Bohemian hospitals (in particular Neratovice, Hořovice, Příbram, Rakovník, Mělník) and can accompany you to the one you choose. I also have experience with births from Netherlands and am open to accompany you based on your (realistic) wishes. "Labour can be the most challenging thing the woman experiences and typically when it comes to feeling supported, women need to be with another woman who has seen this work." "Having another woman to be there and hold us and to put a cold cloth on our face and to tell us we look really beautiful even though we might not, to massage our feet, to rub our hands, allows us to really feel we're doing a good job." If you are considering having a doula with you at the birth, don't hesitate to contact me to discuss further details. More links about who is a doula and why should not it you could want in childbirth, see the section links.